Self-styled "comedy terrorist" Aaron Barschak has been released on bail after being questioned about a suspected bomb hoax. Scotland Yard said a man, 38, was arrested in Wapping and questioned. He was later bailed until a date in May. "He was arrested by local officers after a business premises in Wapping contacted us claiming that the man had made a threat," police said. The alleged incident is thought to be unconnected to the royal wedding. It is thought police were contacted by staff at the building which houses The Sun newspaper. The comedian gatecrashed Prince William's 21st birthday party at Windsor, in June 2003. 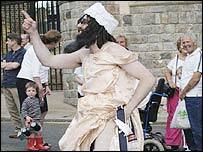 He jumped on stage dressed as Osama Bin Laden and reportedly kissed the prince on both cheeks, before being arrested.